The 100-point scoring system has been the standard way to rate wines used by nearly all wine publications since its introduction by Robert Parker, Jr. in 1983. At the time Parker introduced his scoring system, wine quality standards were nowhere near what they are today. As a result, it is rare to find a wine today that deserves a score below 80, resulting in essentially a 20-point rating system that has little range to differentiate wines because of compression of scores around 90 points. The vast majority of domestic Pinot Noir wines over the past several vintages fall in the 87-93 point range as judged by many wine publication reviewers. In essence, this range becomes the “average,” with scores at or below 86 becoming below average and scores of 93 and above considered above average, even outstanding or extraordinary. In the October 15, 2018 issue of the Wine Spectator, 739 California Pinot Noirs, mostly from the 2015 vintage was rated for the report. The range of scores was 81-95. The average score for all rated wines was 88.5. The Wine Enthusiast website reports that 2,024 domestic Pinot Noirs were reviewed and scored through October in 2018. The range of scores was 80-99. The number of scores in each numerical range was as follows: 98+ 4, 94-97 223, 90-93 1,115, 87-89 535, 83-86 141, 80-82 6. 78% of the wines fell into the approximate “average” range of 87-93. The inflation of scoring over the past several years has been recognized by many. This trend has diluted the value of a 90 point score which has, in essence, become “average.” When this score inflation is combined with the compression of the scoring range, the result is that more wines are pushed into the 92-96 point range, even though they might not be worthy of such praise judged by past standards. A review of all my wine scores for domestic Pinot Noir published in the PinotFile from 2013 to 2018 indicated a slight increase over this six-year interval. Here are the averages of all scores for each year: 2013-89.6, 2014-90.4, 2015-90.2, 2016-90.7, 2017-91.0, and 2018-91.3. It should be noted that the sample of domestic Pinot Noir wines I am offered for review is skewed and predominantly fall in the premium or ultra-premium category. For example, in 2018, all Pinot Noir wines that scored 90 or above in the PinotFile had an average price per bottle of $56.00. Measurable differences between a rating of say 89 or 90 are vague, but the distinction between a score of 89 and 90 holds considerable significance for both the wine’s producer and the consumer. 90 is the acknowledged threshold below which a wine is considered very good yet more challenging to attract a market. A score of 90 indicates a significant step up in perceived quality and desirability and can be more successfully promoted. There are multiple drawbacks to the 100-point scoring system. Its interpretation is not consistent and nearly every wine critic utilizes the 100-point rating system differently. The result is that the scores are not strictly comparable from one wine critic to another. A recent article in Food & Wine, www.foodandwine.com/wine/wine-critics, titled “In Their Own Words, This Is How Seven Professional Wine Writers and Critics Go About Rating a Bottle,” confirmed the highly variable approach wine reviewers use to arrive at a wine’s score. Grading has become an estimation of a wine’s overall quality without specific points assigned to color, aroma, flavor, texture and finish that was Parker’s original intent for the 100-point scoring system. Scoring is highly subjective, often based on personal taste, pleasure and emotion with many wine critics not giving credit to estimated age ability (although admittedly this is highly speculative in most cases anyway). It is challenging for a consumer to align himself with the palate of a wine critic because everyone has a different sense of smell and taste is primarily determined by smell. About 90% of taste comes from odor receptors that are genetically determined. According to a study reported in Nature Genetics in May 2003, no two individual genotypes for smell perception are the same. In this study, 189 people were genotyped and none of them had the same odor-related genes and thus lacked the same set of odor receptors. The Wine Market Council reported a study in 2017 that found Millennials (anyone born from 1980 to 2000) drank 42% of all wine in the U.S. in 2015, more than any other age group. These wine consumers and I have two sons in this age group, could care less about wine scores and only know about wine criticism because that is what I do. One of my sons told me, “My generation doesn’t know the name of one wine critic. We know a few writers for magazines through Instagram and that is about it. We rely on friends for wine recommendations, but we also drink a lot of beer and spirits. No one has the attention span to care about wine journalism, much less wine scores.” A high percentage of millennial wine consumers now use social media such as Instagram and wine apps to find wine suggestions and to post their wine experiences. It is not just Millennials that are turning less often to ratings. A study by Sonoma State University in 2018 revealed the purchasing habits of the American wine consumer: www.winebusiness.com/ news/?go=getArticle&dataId=207060. 1,191 American wine consumers from 50 states were surveyed. 2 percent were Generation Z (ages 21-23), 26 percent were Millennials (ages 24-38), 27 percent were Gen Xers (ages 39-53), 47 percent were Boomers (ages 54-74) and 7 percent were Greatest Generation (ages 75+). 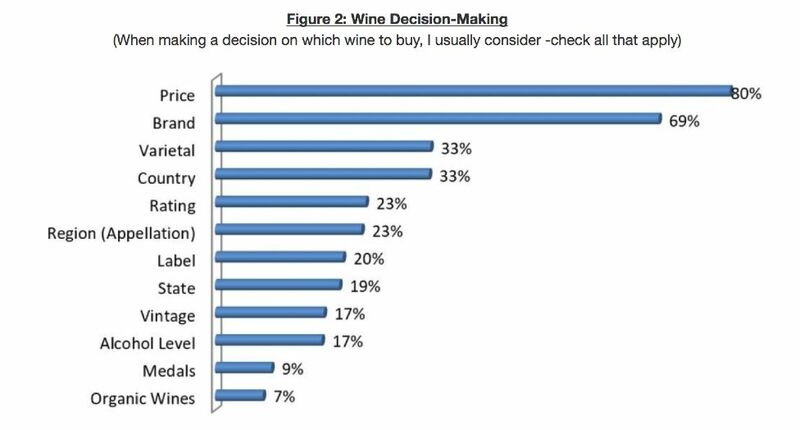 When asked about decision making when purchasing wine, price (80 percent) and brand (69 percent) were most important, with ratings a distant fifth (23 percent). Some astute wine consumers look closely at the descriptors in a wine review and find it of paramount importance relative to the score. The description of the wine seems of greater usefulness especially if the reader can see “between the lines,” and understands certain words or phrases that the writer uses that are a tip-off indicating a special wine. 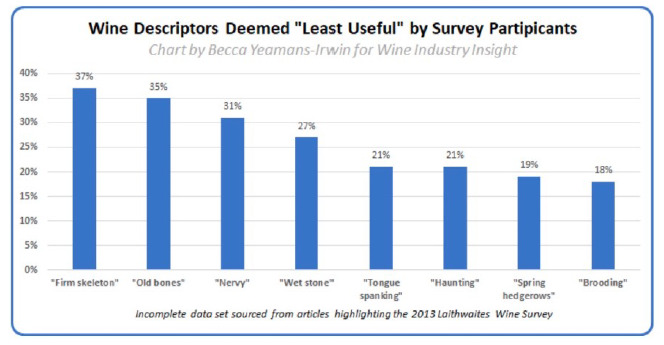 The following charts were obtained from Daily News Fetch created by Wine Industry Insight, Lewis Perdue, Editor and Publisher, at www.industryinsight.com. A common failing of wine scoring relates to wine reviews that don’t criticize wines or explain why they give a wine a low score. Here is a recent wine review from Wine Spectator for a wine that received a score of 87: “Wild sage, dark red cherry and turned earth show on the familiar nose of this bottling. The palate is even-handed with red fruit and chaparral flavors.” If you only read the description of the wine, what could you possibly discern about its quality or relate the description to the score? There is one drawback to professional wine reviews and not specifically to wine scoring that has to do with orthonasal versus retronasal perception of odors. Wine critics use a regime of sniffing, sipping and spitting but this orthonasal perception falls short of overall taste perception. Consumers swallow and experience an additional taste/smell sensation known as retronasal perception of odors whereby odors are perceived when they enter the nose through the pharynx in swallowing. A 2012 article in Physiology & Behavior, www.ncbi.nim.nih.gov/pubmed/22425641, on the retronasal perception of odors, pointed out that orthonasal and retronasal olfaction pathways convey two distinct sensory signals. The full perception of wine is based on the interaction between orthonasal and retronasal smell, taste and texture. This is why I often taste wines in the morning with spitting and then re-taste some wines in the late afternoon with a swallow. I believe this is rarely done by wine tasting professionals. The 100-point scoring system clearly has many drawbacks but it has been and continues to be the main driving force that sells wine. “Amazing Scores for Our 2016 Vintage Wines” reads the marketing tagline for many wineries at this time of the year. 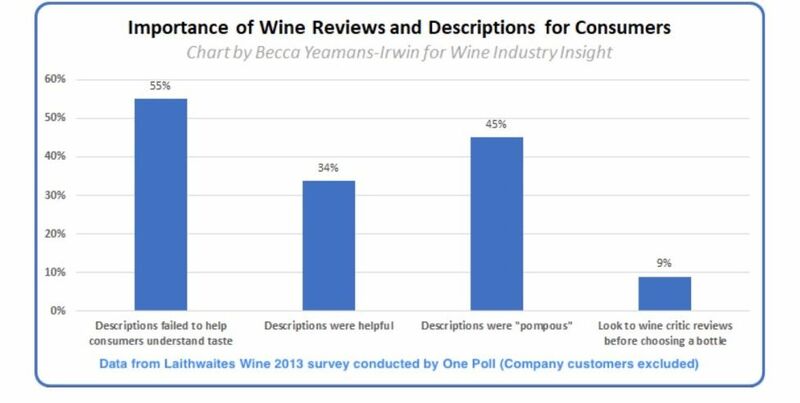 The higher the score, the more retailers reference them, the more wineries promote them, and the more influential the review becomes. Discrepancies abound, however, with retailers known to quote scores for wines from a previous vintage or promote lofty scores that lack attribution. Scores are hollow numbers if not used in conjunction with the score assignor. Some sources quote scores from the Robert Parker Wine Advocate that the consumer may still attribute to Robert Parker, Jr., yet he is only one of nine reviewers for the Robert Parker Wine Advocate. Recently, the Chinese have launched a wine rating system based on Chinese tastes that is aimed at evaluating imported and domestically produced wines. As reported in November 2018 in The Drinks Business, www.thedrinksbusiness.com/2018/11/china-launches-its-own-wine-rating-system/, the Chinese wine rating system evaluates wines mainly based on color, aroma, palate and body using a scoring scale of 10 points. The rating system is said to reflect China’s unique culinary traditions and preferences. Apparently, a panel of judges consisting of members of the China Alcoholic Drinks Association (CADA) and the China Wine & Viticulture Technology Association will do the ratings that could lead to a national wine recommendation system. This critical wine reviewing system is not revolutionary in that the 10-point rating system is simply another numerically-based scoring program. George Vierra, who writes at www.georgevierrawinemaking.blogspot.com, described the Napa Valley College 25-Point Scorecard. This scoring system objectively analyzes wine's appearance, odor and taste for a total final score of a possible 25 points, and also includes a "Final Praises" section that includes further notes on wine style, ageing, food serving suggestions, price, value and where the wine can be purchased. My criticism of this scoring system is that it is but another variation of a mathematically-based scoring program and because it is based on 25 points, would only lead to challenges for the wine consumer to reconcile it with the 20-point and 100-point scoring systems. So what to do with a wine rating system that may have outlived its usefulness and is of little interest to the younger generation wine consumer?How can a new rating system be devised that won’t invalidate the 35 years of published ratings based on the 100-point system? Can we create a wine review with a noble calling, one that offers useful distinctions and criticism than one simply based on a highly subjective and personal numerical award? Can we corral all the important professional wine reviewers who are notoriously independent and have them use a standard review format that would be truly comparable?